Author: Deverell, William Set In . . . Description: William Deverell’s 11th novel is an adventure thriller layered with startling twists. All that Maggie Schneider, a romance writer from wintry Saskatoon, wants is a glorious holiday in the tropics and maybe a little real romance to reawaken her creative juices. What she gets instead, soon after she arrives in Costa Rica, is a nasty surprise. First she is robbed of most of her money. Then she is kidnapped and held for ransom somewhere in the steamy jungle by self-styled revolutionaries led by a charismatic man with a mysterious background. Kidnapped along with Maggie is the vivacious wife of a U.S. senator who has presidential ambitions. 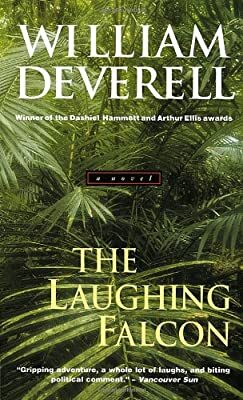 Comical and fast-paced – and drawn from true events – The Laughing Falcon transports readers to the lush rainforest of Costa Rica, where the author himself has lived for much of the last 20 years.